I am back with a review. You all ought to know my love for body wash, I get so excited in the morning when I go for taking a bath (body wash is the reason), I either take bath with a body wash or a Dove soap if I’m out of my body wash. I have already reviewed the Avon Little Red Dress Skin Softener from this range in my earlier post which I absolutely loved because of its smell. Coming back to the body wash, I own tons of body wash and I love the soft feeling that body washes gives. 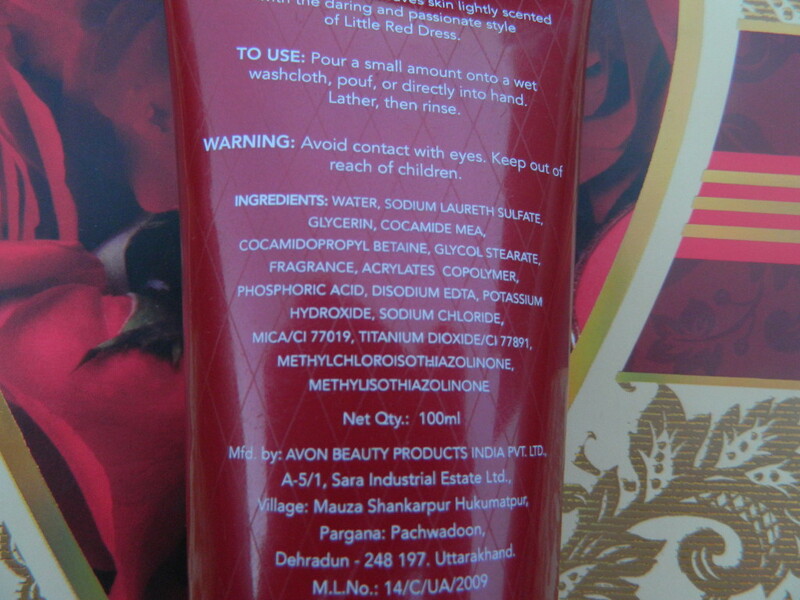 This is one of my favorite body wash. Read my review on this lovely body wash.. Product Claims: Cleanses, softens and leaves skin lightly scented with the daring and passionate style of Little Red Dress. How To Use: Pour a small amount onto a wet washcloth, pouf or directly into hand. Lather, then rinse. Consistency: Its consistency is flowy in fact very flowy, the gel always spills out of the tube when placed open on any surface. See how the gel is flowing off my hand. Fragrance: Lovely fragrance like that of a scent but not as strong as the skin softener, the smell of body washes gives me energy in the morning to move my hands and legs faster (like mom says “haath pair jaldi chalaya karo subah ko”). How about you? Makes skin soft & smooth. Inexpensive for the quantity offered. Lasts long, maybe for 1-1.5 months. I love its smell, it makes me energised in the morning. Lathers well if used with a bath tool and not with hands. Available only through Avon Representatives. Presence of too many chemicals. Sounds good….have never tried this one! I havent tried but would love to..
Will try it soon, Nice review. Mom Ki yaad aa gayi.